Took my daughter's family, including a 6 and ab 8 year old. We had reservations for the 10 AM safari and the 1 PM buffet lunch. Our tour guide, Sky, was very friendly and very knowledgeable. We all learned a lot. The buffet was much better than I had expected. I highly recommend this experience. My family and I got away for a night up to the tent cabins at Safari West. What an amazing experience! The zoo itself is spectacular with so much diversity. We thoroughly enjoyed our tent cabin which was way less "roughing it" than we expected - beautifully appointed and so much fun. We fell asleep and woke up to the sounds of all of the animals, felt like we were in Africa. The Safari tour we did was great and our tour guide Robert was knowledgeable and entertaining. In fact, everyone we met was knowledgeable, helpful and seemed to completely enjoy the work they did. We'll definitely be back! We came for earthday which happens to be my son's birthday. The accommodations look very intriguing though we haven't tried them yet. The tours are very good. The food is outstanding as well. What a great experience for all who attend. Safari West was on my bucket list of things to do with my kids in the summer. I thought it was a great overall experience and worth the money (to do once, in our case!). My kids are 7 and 9. 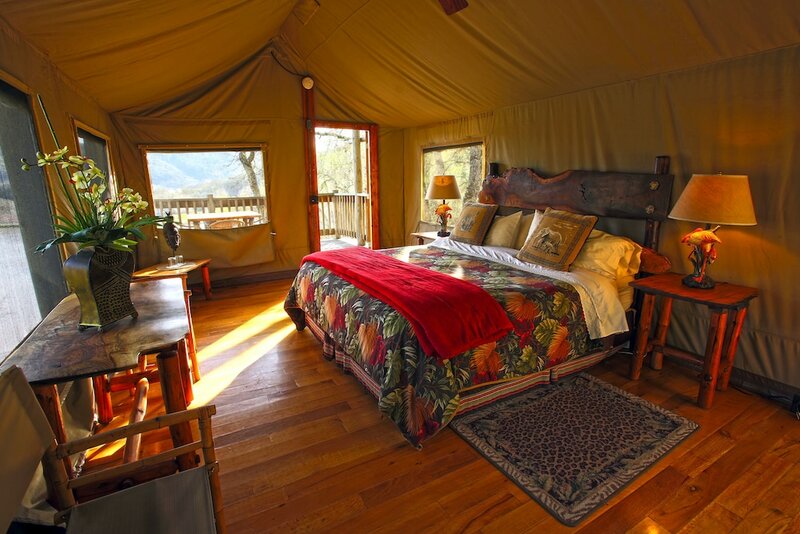 We stayed for one night in a safari tent and then did the safari the next morning. If you read about the experience of spending the night on the website, it very clearly states that the animals make a lot of noise at night. So we came prepared knowing that although we wouldn't get the best night of sleep, it was the experience of feeling like you were actually out camping in the middle of Africa that mattered. The property is awesome and we had a great time wandering around from the time of check in until dinner. We skipped dinner on the property (outrageously expensive) and went to Calistoga instead. When we returned, we relaxed on the deck, enjoyed the view, did a puzzle, etc. For bedtime, bathroom was great and we all showered with hot water and then jumped into our very comfortable beds. We were plenty warm. As I stated before, we were awoken at night many times by the sound of animals, but that was part of the experience, and none of us minded - we actually got a kick out of it! It was cold in the morning, but the second we turned the heater on, the tent warmed up to a comfortable temperature. The breakfast buffet was very good - plenty of options and tasty. The safari was really cool - my kids LOVED sitting at the top of the jeep and we were able to get really close to the animals. It was wonderful to have a guide to talk us through all the different species we observed. The whole experience is expensive, but it was well worth it for my family. We had a great time! If you have AT&T, you will have full cellular service. Bring a lantern as there is not sufficient light in the bathroom during dusk/night/dawn. We loved the safari. It was the highlight of our CA vacation. Our guide Kendra was awesome. You could really tell that she has knowledge and a heart for animals. Dinner was really good. Loved the fresh appetizers and the steak, chicken and homemade sides. I was so tired that the kids and I went straight to sleep (despite some interesting animal noises). Our tent neighbors however kept my husband up until he had to ask them at midnight to "be considerate of their neighbors". That woke me up and thus little sleep the rest of the night (even with ear plugs). Safari West cannot control whether or not others have manners but it is something to consider if you need a good nights sleep. Breakfast was great as well. I wish they would consider adding some additional tents spaced out a bit more so that you didn't have to worry about the people next to you. Had an awesome time at Safari West. The tents exceeded my expectations. The bathrooms were really cold if you had to pee in the middle of the night, but other than that we had a great time. The dinner was also great. Tasty appetizers and which included a variety of fruit, cheese, crackers, meat balls and onion soup. The dinner was also tasty and filling. Dinner included chicken and ribs. Everything was great, but the Cesar salad had a little too much dressing. Seeing the animals was fun, you could get within a few feet of some gorgeous animals. Great experience. A little pricey, but will definitely come back. Loved the place and sleeping so close to so many animals but we were freezing when we had to go to the bathroom or het out of bed. The animals were incredibly noisy as they do not sleep much at night. Te rooster appeared to be on eastern time as he started his calls at 3am. There was no hairdryer in my tent which surprised me but my husband was kind enough to walk to the office and bring one back to me. I do not feel ai got my money’s worth, however, after doing the tour the next day and seeing how much food those animals eat and how many employees they have to tend the animals, I consider the cost to be a donation to the cause. I have gone to Safari West two times recently: Once before the big fire and once afterward. The animals are being taken care of marvelously. I was most impressed with how obviously well cared for they are. And when the big fire hit Sonoma County, the owner and employees saved all the animals while the owner's own personal house burned to the ground. The tour guides are well informed and extremely competent. I loved every minute I was on the tour and every minute I walked around the grounds, ate in the cafeteria, or shopped in the gift shop. This place is a gem! What a amazing time @ Safari West starting with a delicious lunch!!! Potato & Ceasar Salad, grilled veggies, pulled Pork or B-Bque Chicken & Rolls, then Nate our Guide for the day took up on a walking tour to see several types of Monkeys as well as many many types of Birds which Nate was knowledgeable on them all! Then we got on an Jeep to see the wild animals which again Nate knew a lot about them all & really got into explaining each 1 which I Loved!!! He really Loves His job & that’s huge in any business!!! Can’t wait to go back!! Safari West places you adjacent to Safari West. This 31-room campground welcomes guests with conveniences like free breakfast, a restaurant, and free self parking. Start your day off right with a free continental breakfast. In addition to a meal at the onsite restaurant, you can also enjoy a drink at the bar/lounge. All 31 accommodations feature furnished balconies, free bottled water, and ceiling fans. Free toiletries are also included. Guests of Safari West enjoy access to free WiFi in public areas, a meeting room, and spa services. If you decide to drive, there's free parking. Helpful staff can provide concierge services, luggage storage, and a safe deposit box at the front desk. Other amenities at this hot springs campground include free newspapers, a terrace, and a garden. Guests with plans to arrive after 5 PM must make arrangements in advance by contacting the property using the information on the booking confirmation. Reservations need to be made in advance for massage services. Contact the campground at the phone number listed on your booking confirmation.